Sheffield-based artist Roanna Wells is known for making a mark – very literally – most of her works feature a collection of painted or stitched marks. In 2017, she expanded her mark-making process to include the general public, and she spent six weeks hosting Tracing Process where passers-by could add their own series of marks to Roanna’s painting. Roanna speaks to writer Hannah Clugston about where this interest came from, and how a repeating pattern can do more than just look nice hung in a gallery. In your work you collect marks, would you call yourself a collector? I love collecting things. I’ve got a collection of spoons and feathers, and I have always loved finding pebbles on the beach and arranging them. Although it is not an obvious concept in my work, I do think collecting features a lot in my aesthetics and in the way I like to go about things. When did your “mark making” begin? I suppose it started with my degree, which was in embroidery in Manchester. I did a whole series of works just using black thread on cream fabric, and then I started to branch out into colour. It was a little thing that got me started with colour; I got my old box of paints out and decided to use up all the colours that were already dried up on it from years back. I did a little swatch of it and then just started playing about with the brush, making marks. 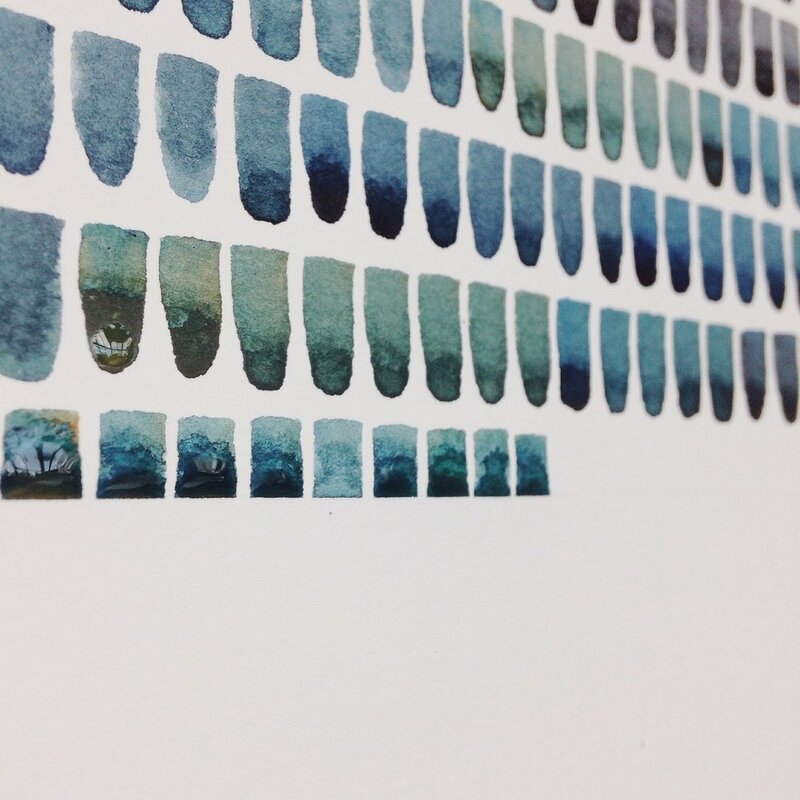 I really liked how the paint dried and collected in different ways depending on whether the paper was flat or upright. Spaces Between isn’t just a series of marks, it also traces the passing of time. Can you tell me a bit about this project? I’d had a bit of a creative block and I was having a few personal issues as well; I had just gone fully self-employed and I was having the problem of earning money while also trying to fulfil my creative work. So, I went down to Bristol to use a friend’s studio as a sort of mini residency – just to get me out of my usual space and into a different environment to see if that would push ideas. I decided to start documenting a time period of separation from a certain person and it was almost a bit of self-therapy. I wanted to get something out visually without having to be really direct and say: “this is about this”. 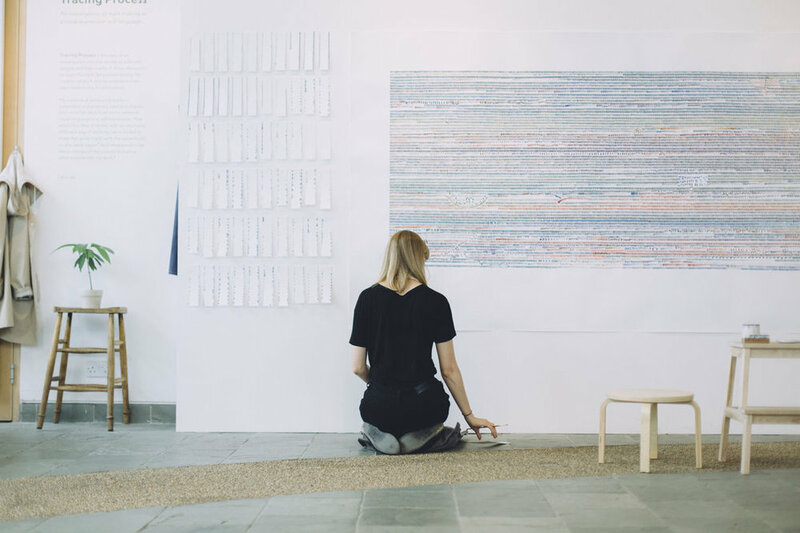 Each brush mark represents a minute in a day and each colour change represents a different day. Your work is clearly very methodical and controlled. How did you feel handing that over to the public in Tracing Process? It was a really nice experience. It was partly an exploration of my orderliness and my neatness. It was really nice to see the contrast between other people’s spontaneity and messiness, and my own way of making marks. There is a clear definition but they all blend quite nicely. I was interested in what happens when you give someone the instructions “this is the brush I use, this is the paint I use, this is the mark and how I make it” and then seeing if they do it neatly or go off-course. Are you as interested in the process of making art as you are the final piece? I really love the way that when you are repeating one single mark by hand there’s obviously going to be some variation because of the way hands work and the way humans work. So, yes I think I am just as interested in the process because that’s how the work is made. My Desert Island Disks installation was only there for the time I was creating it. At the end, I had to sand it all off and paint over the wall. The focus there was on the process and marking the passing of time, and it was only there for people to see while the exhibition was open. I think this interest in process is also why I collect the tissues I dab my brush on. I think the process of choosing to collect these tissues and choosing to display them puts more emphasis on what they might be in a way, because you could quite easily discard them. It brings up the question of what is art? That’s still a mark you’ve made, it’s just a different type. It’s just an unintentional mark and sometimes they’re the nicest ones, aren’t they? It’s interesting because my work is so careful and controlled, but then I am really interested in these spontaneous marks on these tissues as well. I suppose with artists where their work is big, messy and splashy they just wipe up excess paint because their work is the spontaneity, whereas because my work is so controlled the spontaneity is found where I dab my brush. Maybe that’s why I collect them. What do you have planned next for your mark making? I’ve been looking at some statements by Paul Klee that tie into this slightly more psychological, explorative aspect of my work. I am interested in tapping into different thoughts and making things a little bit deeper without having to paint your emotions. I do feel that there’s some change coming – just not sure in what way yet!